At AGFS we are proud to provide our pupils with much more than just brilliant teaching. Our extensive Co-Curricular Program ensures that pupils receive a well-rounded education where life enriching opportunities are experienced and important personal skills are nurtured. The Co-Curricular program provides a range of opportunities beyond the classroom including, but not exclusive to, timetabled weekly enrichment sessions, 12 full drop down days per year, sports teams, tours, music concerts and school shows and excursions to undertake outdoor and adventurous activities, university trips and careers events. Our extensive student leadership and community volunteering projects in local Primary Schools and Care Homes form an important aspect of this program. The enrichment programme provides students with the opportunity to develop skills, experiences and memories outside of our academic curriculum. In some cases such as STEAM, debating and cross country students are presented with an opportunity to represent AGFS at an elite level in regional and national events (please see elite information below). The programme is offered to all Y7-9 students and takes place on Wednesday afternoons between 12.50-2.50pm. Students participate and complete one enrichment club between September – February under one theme and another between February – July under a different theme. This gives students an opportunity to develop different skills in a range of areas. Students and staff set a bronze, silver and gold target to achieve during their enrichment club. If students achieve their gold target they are awarded with the corresponding coloured stripe to sew onto their school bag strap. At the end of the enrichment term, parents will receive an update on the standard their child is achieving in enrichment through reports. Each student will also receive a certificate detailing the standard and/or enrichment stripe they have achieved for each enrichment club. Y7 will complete drop down days that address team building activities, a maths day, PSHE day, science museum trip, Drama work shop, STEAM day and activities week. Y8 will complete drop down days that address rugby, PSHE, house activities, ICT Faraday Challenge, STEAM, geography trip to Walton on Naze, science space day, Bletchley Park maths day, history day and activities week. Y9 will complete drop down days that address STEAM, conflict resolution (seeking forgiveness), Natural History museum trip, Humaneutopia workshops, V&A museum trip, PSHE, religious community, globe trip, drama workshops and activities week. Y10 will complete drop down days that address PSHE, drama, art and career workshops, music workshop, Jack Petchey, science forensics day, STEAM, Amy Winehouse Foundation, house activities and activities week. Y11 will complete drop down days that will be tailored to prepare your students for their exams. There are 8 drop down days interspersed throughout the academic year for Y11. Multiple subjects will run on the same day and whilst your child may be doing a GCSE in all of them, teachers will select the session your child. Activities completed during these days include walking talking mocks, coursework completion, mastering revision techniques. Activities week in the last 4 days of term includes the two days of team building and problem solving/practical events to consolidate to consolidate the school values of ambition, growth, fellowship and scholarship. It also includes the Thorpe park reward trip for students that attain the highest achievement points and lie in the top 10% of the year and annual general meeting day for those remaining to reflect on the year. This week then ends with sports day. At AGFS, we are proud to announce that we are moving certain areas in the co-curricular towards regional and national performance. There areas include cross country running, debating, singing and dance. Cross Country – Cross country has a rigorous training regime in place which includes enrichment club on Wednesdays, Thursday lunch time training and students training in their own time. We are seeing strong performances in Y7 and 8 championships with Y8 girls coming third in competitions and a few second places. We look forward to seeing even more successes in this area. Debating – A debating club has been established during enrichment with Y7-9 students. These students are working closely with an experienced member of staff in this area to develop debating skills and go on to compete in Up for Debate competitions held by PIXL. Choir – An elite choir rehearse after school with an external vocal coach and we look forward to the choir entering and succeeding in competitions. Dance – The newest addition to our elite area includes street dance which is coached by an external company. Students will rehearse after school and again we look forward to seeing our AGFS dance group enter and succeed in competitions. This programme aims to develop leadership skills right from the start of a Year 7’s career with GFS. Students will have the opportunities to volunteer and help at school events, participate in student meetings and receive leadership training. The student leadership team at GFS is comprised of the senior team made up of Y10-11 students. 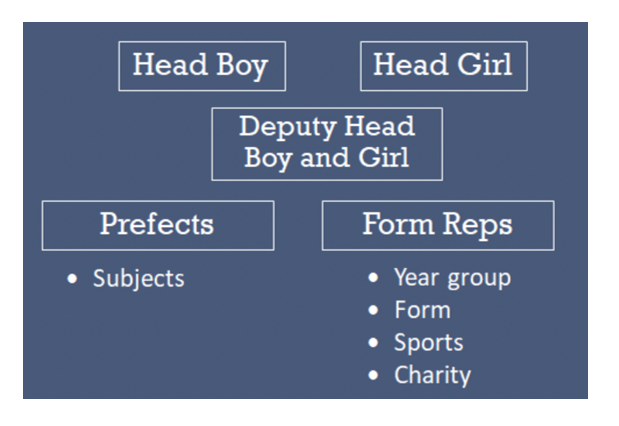 This team includes head and deputy student leaders and prefects associated to different subjects. The remainder of the team is made up of form/house reps from all year groups. The senior team go through a rigorous election process which includes completing an application form and providing two references (one personal and one professional). Shortlisted candidates attend an interview and those successful move through to the next stage and participate in a debate that takes place during assembly. Fellow students and staff cast their votes and Mr Spiers selects the final team when he reviews the results. This senior team will be in place from the beginning of next term. Year 7’s will have a similar opportunity at the beginning of the year to put themselves forward as a form/house rep. Y7-9 also have the chance to complete student leadership training through enrichment. Young student leaders and senior student leaders lead their own student voice meetings. Senior student leaders complete lunch duties, contribute and lead school events and receive leadership training. Our student leader team are proud to bridge the gap between teachers and students, have a say to improve the school whilst developing leadership qualities that prepare them for the real world. KS4 MFL Barcelona Trip - This is a fantastic opportunity for students to develop and practice their language skills as well as experiencing and immersing themselves in some typical Spanish culture and cuisine. Black History Month Concert: Students lead in performing a concert comprised of performances, speeches and monologues to celebrate black history. Prize Evening: As a community AGFS students, parents and staff celebrate the achievement and successes of students. School Musical Production: Each year the school runs a production. Productions such as Matilda and Hairspray are our big show stoppers. Aspirations Evening: An evening will provides students and their parents to speed date different professionals and find out how they got into that industry and what they need to get there. An experience that will inspire students and spark their ambitions. Summer Concert: Another student led production showcasing performances and speeches.